Ira Goldman advises employers, as well as institutional trustees and service providers, in designing and administering qualified and non-qualified pension, savings, retirement and welfare plans, as well as executive deferred compensation arrangements. He also represents creditors and debtors in workout and bankruptcy proceedings. He has particular experience in representing fiduciaries for public debt in Chapter 11 proceedings. A frequent speaker, Ira often addresses professional groups on issues of employee benefits law and commercial and bankruptcy law. He has also written A Poet’s Guide to Employee Benefits Law. We were retained by a client appointed to act as the independent fiduciary of the Trust Advisors Stable Value Plus Fund due to allegations of wrongful conduct regarding the Fund's assets, which total more than $260,000,000 in pension plan investments of approximately 1,500 pension plans, to represent it with regard to bankruptcy and employee benefits issues. On September 30, 2005, the client filed a Chapter 11 case in the Connecticut Bankruptcy Court to preserve the assets of the Fund and ensure an orderly distribution of the Fund's assets to all investors. Following extensive negotiations with the Court-appointed Investor Committee and other parties-in-interest, the firm prepared and filed the Fund's Plan of Reorganization with the Court. After submitting the Plan to investors for approval, 99% of all voting investors voted in favor of the Plan. On July 28, 2006, the Plan was confirmed by the Connecticut Bankruptcy Court. This case is one of only a handful of Chapter 11 cases filed in the Connecticut Bankruptcy Court to confirm a Plan of Reorganization in less than one year. Represented major national bank as trustee for in excess of $500,000,000 of outstanding Notes and Debentures, held in many instances individually by elderly and retiree investors, against national mortgage, investment and insurance services entity and its sister company in joint Chapter 11 bankruptcy proceedings in Spokane, Washington. Actively participated in negotiations and bankruptcy court proceedings on behalf of the bank and the noteholders for which the bank acts as fiduciary, to maximize assets and recovery to holders. Issues involved included resolution of inter-company issues, third party causes of action including allegations of fraud against top executives, interplay with district court class action proceeding and orderly sale of company assets. 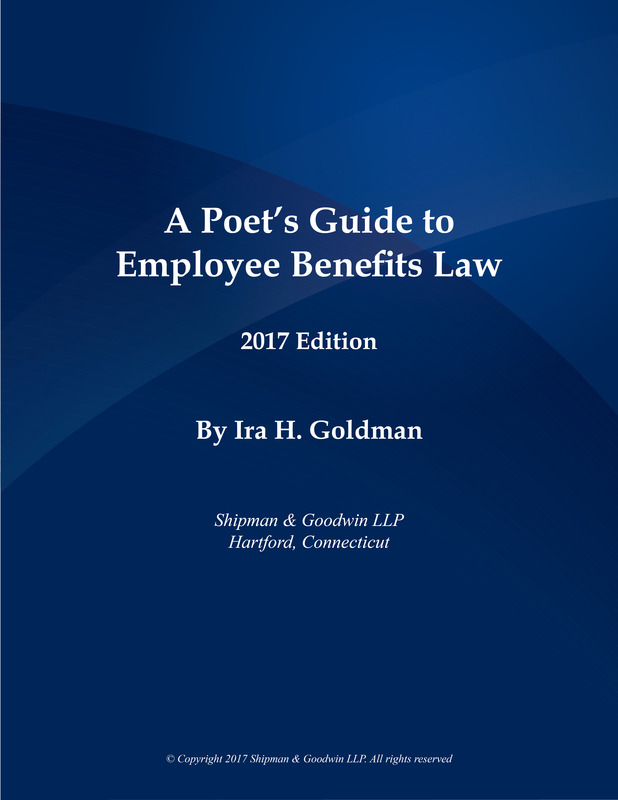 Click to view "A Poet's Guide to Employee Benefits Law," a basic benefits guide authored by Ira Goldman.